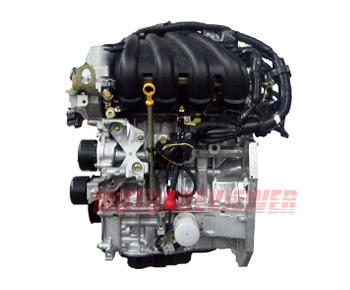 The Nissan HR16DE engine is the result of Renault's K4M engine evolution. Renault cars also were fitted with this engine but under other the different name - H4M. The new engine came to replace the old QG16DE engine. The HR16DE has variable valve timing system on the intake camshaft, the electronic throttle, and two fuel injectors per cylinder. The timing chain is not reliable and stretched out too early. Valve gaps adjustment is required for the HR16DE every 60,000 miles. There are no hydraulic tappets. The engine was modernized very well also. The new camshafts and the fuel system helped to reduce the fuel consumption and increase power and torque, and now this engine meets the European environment standard Euro 5. Summing up, the HR16DE is a pretty conventional 1.6-liter engine. We also can say that the HR16DE is the smaller version of the MR20DE. 1. A whistle of the engine. Noise is a sound of an alternator belt. Tighten it up. If it's not helped, replace the old belt with a new one. 2. Engine shuts off. The problem is in the relay of ignition unit. Nissan officially recalled a batch of cars with that issue. It fixes by replacing of the ignition unit complete. Anyway, you are risking stuck in a middle of a road. 3. Engine vibrations. Usually, that tells about the death of right engine mount. 4. Besides, the HR16DE-H4M engine is difficult to start in the cold weather. You can change the spark plugs, start with the open throttle, it may improve the situation. That is such an unpleasant feature.